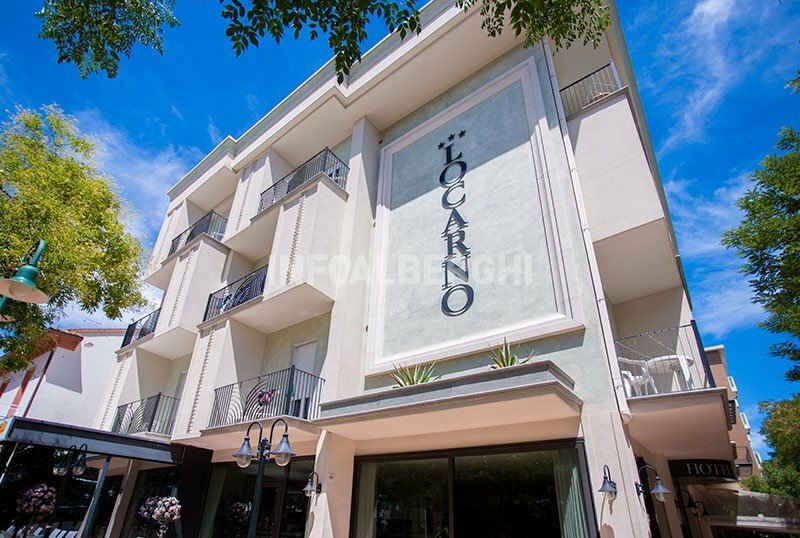 The Hotel Locarno is a completely renovated 3-star hotel. It is located in Cattolica in the central area, near the beach. It has many services dedicated to families and reserves for guests some conveniences such as parking, the garden terrace connected to the bar to relax outdoors and modern rooms with balcony. Admits pets of all sizes. The hotel is located in Cattolica, overlooking Viale Dante in the central area. The beach is about 2 minutes walk, the center with the dancing fountains of 1° May square can be reached on foot in 10 minutes. Recently renovated, they have a balcony or terrace, satellite TV and digital terrestrial, direct dial telephone, electronic safe, individually controlled air conditioning, ceiling fan, WI-FI connection, private bathroom with shower, complimentary toiletries and hairdryer. On request: minibar and breakfast in the room. The property has a garden terrace overlooking the promenade and communicating with the American bar, living room, large air-conditioned restaurant connected to the open-air porch, satellite TV room, elevator, bicycles available to customers. Theme nights are organized. PARKING: free covered parking is available nearby. PETS: pets of all sizes. At the restaurant: baby food, vegetable broths, smoothies, high chairs, early restaurant opening, bottle warmer. On the beach : children's pool, entertainment, mini / baby / junior club. BREAKFAST: international buffet breakfast with homemade desserts, yogurt, cereals, fruit juices and savory dishes. LUNCH AND DINNER: Romagna home cooking with typical dishes of meat and fish to which we add traditional national dishes in two menus to choose from. VARIATIONS: vegan cuisine on request. The hotel has an agreement with the Bagni Marcello 76-77, equipped with swimming pool, hydromassage, gym, entertainment. starting from 68 euros per person per day. starting from 75 euros per person per day.